This custom built Colonial Williamsburg Reproduction has 5 BR, 3 1/2 BA features pine flooring throughout, taller ceilings 1st. floor. 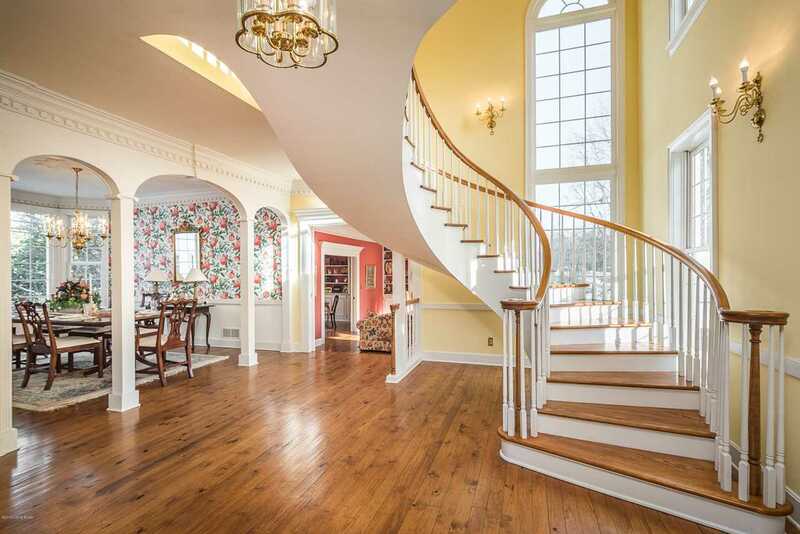 Two story foyer w/handmade curved floating staircase to 2nd. floor. Lavish moulding throughout home. Sitting room off foyer has full wood paneling. Enter formal dining room with large bay window through Triple Arches. Kitchen has tall Alderwood cabinets, central island, walk-in pantry. Florida room for family dining,study, watching tv etc. This room surrounded by deck with pergola.First floor powder room. A cozy family room w/fireplace & bookcases . Study with bookcases, dry bar and back staircase to 2nd. floor. Upstairs master bedroom w/large bay, 2 walk-in closets, plus linen closet. Large sink area with makeup area, whirlpool tub and separate shower. Three other bedrooms with two closets. Hall Bath has double vanity and tub/shower. Laundry area has cabinets. The lower level can be a separate living area perfect for two family home. Drive to rear of home with patio and double glass doors into home. Very large room with fireplace, bedroom, dining area, complete kitchen with refrigerator, stove, dishwasher and double sinks. Large handicapped bathroom with 6' deep whirlpool and roll in shower and under vanity. New vinyl laminated wood flooring in this level. Many updates since owning home. SchoolsClick map icons below to view information for schools near 7105 Hunting Creek Dr Prospect, KY 40059.